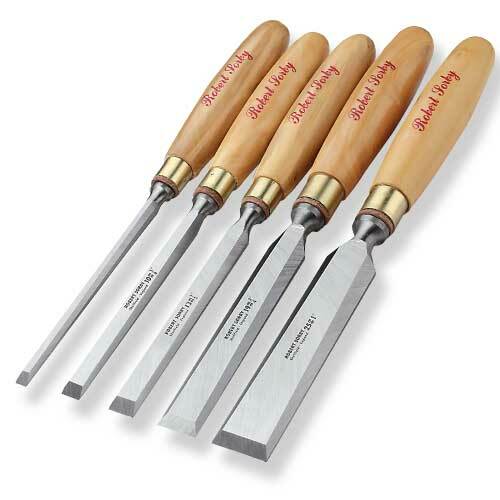 Bevel edge chisels are the most versatile and widely used of all bench chisels and are the most absolutely essential of woodworking tools. Sorby makes them in 2 styles - the Traditional Bevel Edge and the Gilt Edge. 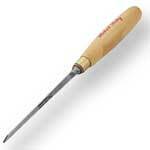 The Traditional Bevel Edge Chisels have shorter and less pronounced bolsters than the Gilt Edge versions. Offered here with smooth Boxwood handles, these Traditional chisels have blades that vary from 5" to 7" in length depending on size, with overall length ranging from 10-1/2" to 13-1/2". All Sorby chisel blades are forged from a special alloy Sheffield steel that has a perfect balance of toughness, edge retention, and sharpness. Precision grinding ensures backs that are truly flat and bevels that are crisp and accurate. 5 Pc. Chisel Set - Includes a 1/4" (6mm), 3/8" (10mm), 1/2" (12mm), 3/4" (19mm), and 1" (25mm) chisel, and come in a cardboard presentation box.